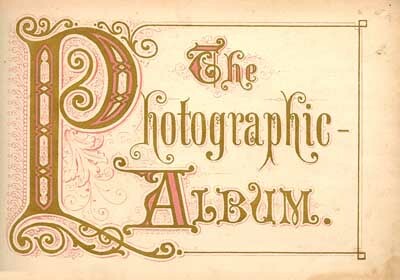 We have finally started to put together a photograph album for the Stanaway family! We have split the album into family groups based on John James Stanaway’s children. We have also an album just on John James Stanaway. If you have any photographs which you would like to share please contact us and we can organise to have these included. This entry was posted in Uncategorized on January 15, 2016 by gregorypaulskinner. We have recently updated the Roll of Honor page. Changes include a picture gallery of the for young Stanaway’s who did not return along with their remembrance wall and/or headstones. We would like to thank the families who have provided these pictures. Also a special thank you to the Historical Society from the Vevey (St. Martin’s) Cemetery, Switzerland for providing a picture of Alfred Stanaway’s grave. We also acknowledge the Australian War Memorial Collection for the picture of Alfred’s original grave in Switzerland. We do have a few portraits of a number of the men who served but not for all the names listed on the Roll of Honor page. We would like to if possible to add portraits of all these men, if any readers have any which they would like to share please contact us. We had only started this web page in July 2015 and already we have over 8,000 hits. The link below is for those of you who are interested in the stats for last year. The people at WordPress.com have prepared a 2015 annual report for Johnjamesstanaway.com. This entry was posted in Uncategorized on January 13, 2016 by gregorypaulskinner. We have completed the page for Helena (Lena) Stanaway 1870 – 1963 – JJ’s and Sarah’s fifth child. If you have any further information on Helena please leave a post on her page. This entry was posted in Uncategorized and tagged Stanaway, Stanway on January 13, 2016 by gregorypaulskinner. The following is an essay by Ruth Miriam Ross, School Teacher and Authoress, North Auckland. It gives an in site into George Frederick Russell – John James Stanaway’s first employer in New Zealand – again the familiar name of Dr John Logan Campbell appears. Russell was present at the Sydney sale in January 1831 when McDonnell bought the “Sir George Murray” and the Horeke property where she had been built. He sailed immediately for Hokianga and took possession of the Horeke, McDonnell following two months later in “Sir George Murray”. Russell remained at Horeke for about eight years, either as McDonnell’s partner or as his manager. During this period he bought eight blocks of land, mainly in the kauri-forested Waihou-Mangamuka area, disposing of most of them prior to his first Kohukohu purchase of June 1839. By that date he had parted company with McDonnell and was already trading at Kohukohu on his own account. With the shipment of cargoes of kauri spars and squared timber to London and other markets, Russell’s business rapidly expanded, Kohukohu succeeding Horeke as the centre of the Hokianga timber trade. “I would have often been puzzled to get on only for my friend Russell who is a very good fellow and has lent me many a helping hand”. Russell’s wife was a close relative of Nene, who is said to have left to Russell’s family the goblet presented to him by Queen Victoria. Russell did not actively campaign with Maning and Webster in 1845, but helped to supply the early Hokianga war parties opposing Heke, and was later instrumental in preventing the spread of hostilities to Hokianga. Kohukohu was in Ihutai territory, and the Ihutai, led by Te Wharepapa, was one of several Hokianga tribes which threw in their lot with Heke. At the beginning of January 1846 Heke and a small band of followers eluded Te Taonui, and it was at first feared they might attack Hokianga. A detachment of Maoris was accordingly sent by Te Taonui to protect the European settlers, and in addition HMS Osprey, Captain Patten, was ordered to Hokianga. On arrival off Kohukohu, Patten announced his intention of attacking the nearby Ihutai pa. Russell called the European settlers together and dissuaded Patten from an action which would have jeopardised European lives and property and ended neutrality in the Hokianga. Being “small in size and quick in movement”, Russell was known to the Maoris as “Piwakawaka”. He died in June 1855, aged 46. A son, Frederick Nene Russell, was elected unopposed as the first Member of the House of Representatives for Northern Maori. The Kohukohu business was carried on by John Webster, who married Russell’s eldest daughter. New Zealander, 18 Jul 1855 (Obit).trade. This entry was posted in Uncategorized and tagged Family Connections, George Frederick Russell, Hokianga, Kohukohu, New Zealand, Stanaway, Stanway on January 1, 2016 by gregorypaulskinner. I have recently read the book titled Hokianga by Jack Lee. It has provided some in site to the early european settlement in the Hokianga. It covers the lives of the early settlers and their family’s like McDonnell, Russell, Maning, Clark, Polack, Polynton, Cassidy, Marmon, White, Marriner and many more. From the book we discover that McDonnell, Russell and White were the three main players in the local timber trade, with McDonnell and White constantly feuding with each other on the south side of the upper Hokianga and Russell on the north side based out of Kohukohu. Of most interest were the Russell’s and the Marriner’s both of whom eventually settled in Kohukohu, on the northern banks of the upper Hokianga. Marriner Street in Kohukohu is named after the family. It was the Marriner’s whom John befriended and it appears they became life long friends, both in Hokianga and later in the Kaipara. George Frederick Russell had sailed from Sydney to Horeke in 1831. He then in 1839, purchased properties in Kohukohu, setting up his own business as a timber trader, shipping kauri spars and squared timber to London and other markets. It was George Russell, as we have come to discover, who first employed our John Stanaway perhaps it was when Russell set up his business in Kohukohu that he needed an experienced hand at loading ships rather than just a sawyer. Maybe he even travelled back to Australia to find a man to fit the bill, maybe at the same time John was looking for work and the two men met. Perhaps it was this employment opportunity which bought John James Stanaway to New Zealand and why he settled initially in the Hokianga. It may be why he could afford to bring his pregnant wife, he may not have been having to rely on being self-sufficient rather he had a place of employment already organised and shelter of some sort was offered by George Russell. George Russell died in 1855 aged in his mid forties, the only lasting traces of George Russell are the cannons he purchased for defence of his by then small settlement in 1845 during the Heke Wars these are now tourist attractions. A particular painting I would like to bring to your attention. 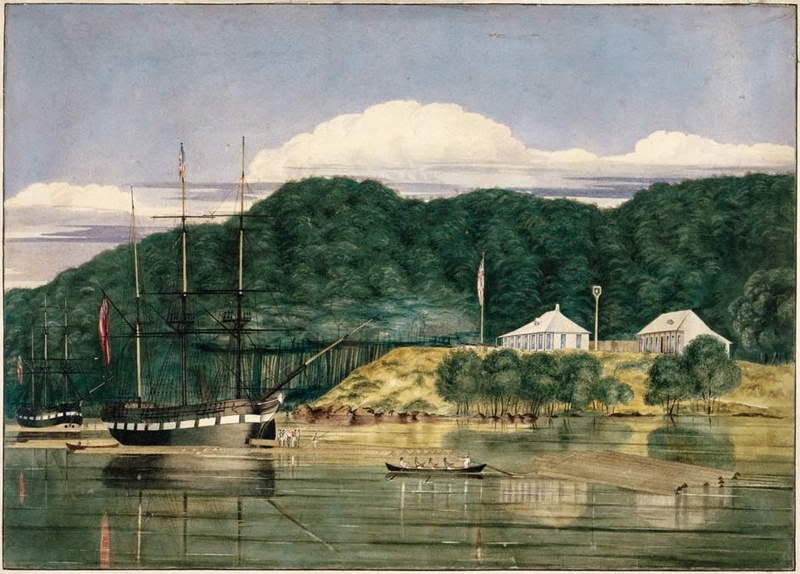 It is Charles Heaphy’s painting of Kohukohu on the Hokianga Harbour, painted in 1839. It shows G. F. Russell’s house and timber yard at Kohukohu, with a ship and a barque, the Francis Spaight (nearer vessel) and the Bolina (on the left) loading kauri spars; and a row-boat hauling spars. On the hill behind is dense native forest (Credit: Alexander Turnbull Library ref C-025-020). It is possible that included within this paint is our John James Stanaway, either in one of the two rowing crews or in the loading gang. This entry was posted in Uncategorized and tagged Family Connections, George Frederick Russell, Hokianga, Jack Lee, Kohukohu, New Zealand, Stanaway, Stanway on January 1, 2016 by gregorypaulskinner.